General lack of movement is likely the culprit of the aches we feel at the end of a long day at the computer. Standing desks have become more available, however, you may find you simply feel different strain from standing in one place all day, compared to how you'd feel after sitting in one position all day. Movement is important to prompting our physiologic processes (such as blood flow) into action, maintaining good musculoskeletal health and reducing repetitive strain injuries. The best ergonomic advice is to sneak in little bits of movement whenever you can; don't maintain a single posture for too long. While moving around every 20-30 minutes is ideal, we can all get lost in our work/play and before we know it hours have gone by since we last left the desk. Because small, repetitive movements can actually be more damaging to our muscles and joints (did you know that the amount of force exhibited by a finger from typing all day is the same as picking up an elephant with that one finger!?!) it's important to set ourselves up to minimize strain on our bodies while seated/standing, so when we get lost in our work/play online, we can still enjoy our work/play in the physical world afterwards! These are a few brief, broad points to consider when evaluating your computer set up, whether you're seated or standing many of the same rules apply. When sitting in your chair, looking straight ahead, your gaze should naturally land in the top 1/3 of your computer monitor. If the height of your monitor isn’t adjustable, try stacking a ream of paper or two underneath it, or purchase a monitor stand to achieve the desired height. If using a laptop, try using a detached keyboard to give you some ergonomic flexibility throughout the day. Your computer monitor should also be placed directly in front of you at one arm’s length distance away. While sitting back in your chair (or standing), reach forward and see if you can touch the screen with your fingertips. If not, adjust it so it lands right about the distance of your fingertips. If you spend time reading textbooks or other documents, consider investing in a book stand to promote a more neutral neck position. - If you have arm rests, use them to let your shoulders relax and keep your upper traps from overworking. - Rest your wrists on a wrist rest or on the desk, if your keyboard is low profile. - Keep your elbows close to your ribs. This is especially important for your mousing hand - don’t let it wander away from the keyboard. - Elbows should be open, slightly beyond 90˚. - Hips should be open too, slightly beyond 90˚. Even though the image above says "Thighs horizontal", notice the angle of the hips is slightly beyond 90˚. Keep your knees slightly lower than your hips. - Your feet should rest flat on the floor, regardless of shoe type (heels or flats). If needed, a foot rest can help accomplish this goal and make up the difference if your wear heels one day and flats the next. Keeping your feet flat on the floor takes pressure off the back of your knees, improves circulation, and removes pressure from the nerves in the back of your legs. 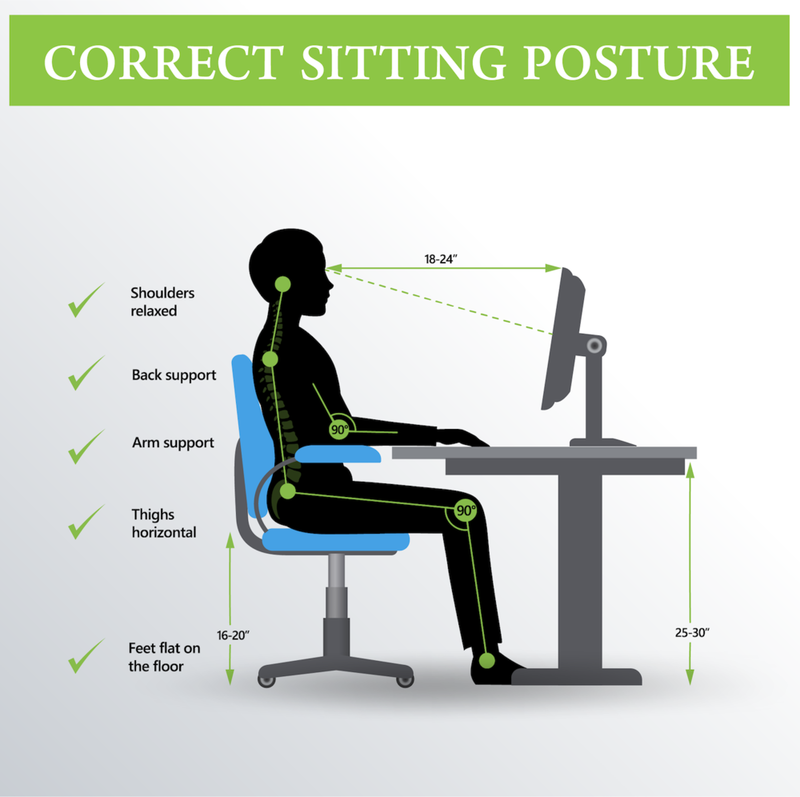 How you initially sit down in the chair can make all the difference in promoting good seated posture. Sitting shouldn't require a lot of work; your head should be stacked over your shoulders, and your shoulders stacked over your hips, promoting a neutral spine. Try to maintain the natural curve of your lower back; use a towel or other support if your chair doesn’t fit/support the curve of your low back. There's been a lot of research and development in the world of ergonomics over the last 10 years, and there's lots of details that go into creating a good ergonomic set up that's unique to you. If you have questions, please let us know at your next appointment.